Edmodo is a free and great educational app for Windows 8 and 8.1 computer. The app is useful for teachers, parents and students as it is more than an educational app. It is an app for collaborating and learning easily and freely. On the startup of Edmodo, you will be asked to permit the educational app to send you quick status updates and notifications and run to keep you updated with information of the app. Click on allow if you want it to otherwise click on block. 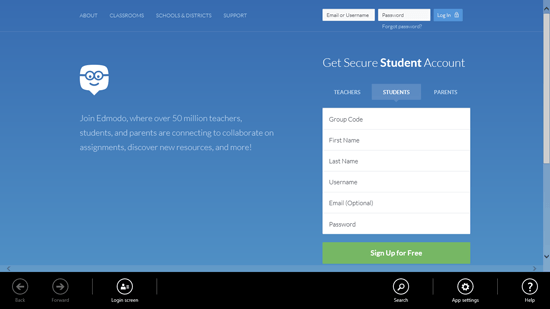 On the next page of the app, you will have to sign in or sign up Edmodo. You can sign up for free as a teacher, student or a parent. It is easy to join Edmodo community, you can sign up as teacher and give your students the group code where they can join your class on Edmodo. For signing up as a student or a parent, you will have to provide the group code given to you by the teacher. If you don’t have a group code then you will not be able to join the Edmodo collaboration community. 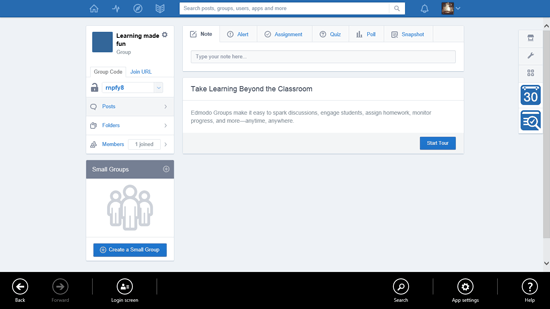 As a teacher on Edmodo, the features of the account will include a library, planner or a calendar, connect account with Google Drive, create polls, give assignments to students, moedrate posts of students, create and give badges to students, keep a progress or grade book, create quizzes, view insights and reactions on different posts and activity and invite other teachers to Edmodo. The account of a student on Edmodo has features like submit an assignment digitally, viewing grades or progress, viewing planner, viewing folders in the groups, taking quiz, viewing badges and using the backpack. The account of parents in this educational app includes features like adding your child to your account, accessing his or her assignments, his grades, upcoming events, alerts, latest posts, your planner, etc.